Uncancelled Liberty Loan of 1917 (United States Government) 1917 50. Blue “50 THREE AND ONE HALF PERCENT” and Treasury Seal. 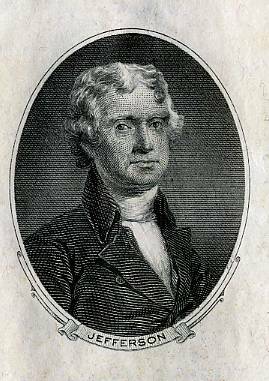 Thomas Jefferson, left. Statue of Liberty, right. Eagle and Columbia statue on back. Embossed large Treasury seal above register’s name. Excellent condition. Serial Number 380275. Error with replacement coupons with different font size. Facsimile signatures of Teehee and McAdoo. 24 Unused Coupons attached. On April 24 congress passed an act authorizing an issue of $5,000,000,000 in bonds and $2,000,000 in certificates of indebtedness. The secretary of the treasury decided to place before the country a 32.000,000,000 Issue of bonds, in addition to a certain amount of short term certificates to meet the needs of the allies. The announcement of the initial offer of bonds was made May 2 and the details were made known May 14. The bonds were dated June 15, 1917, and bore interest at the rate of 314 per cent per annum from that date, payable semiannually on Dec. 15 and June 15. They will mature June 15, 1947, but may be redeemed on and after June 15, 1932, in whole or in part, at the option of the government. The bonds are exempt, both as to principal and interest, from all taxation except estate or inheritance taxes. Provision was made for converting the 3% per cent bonds into bonds paying a higher rate of interest if issued by the government daring the war with Germany. The dates for paying for the bonds on the installment plan were: 2 per cent on application; 18 per cent June 28. 1917. 20 per cent July 30, 30 per cent Aug. 15 and 30 per cent Aug. 30. In floating the loan Secretary McAdoo took every mean* to make it popular and to clve every citizen of the United States an equHl opportunity to subscribe for the bonds. lie made two trips through the country in order to explain the necessities of the government, the great value of the bonds and the wisdom of the people Investing In them. The federal reserve system afforded a great Instrument for the organization of the necessary machinery to distribute Information, sell the bonds and collect the vast amount of money placed at the disposal of the government. The twelve federal reserve banks, which are the fiscal agents of the government, became the headquarters of their respective districts In handling the lot n. The direction of the whole operation was centered In the treasury department and the plan of dealing with the several districts through the federal reserve banks resulted in the establishment of a workable organization that handled the situation expeditiously and effectively. The national banks, state banks, trust companies, private banks, bond houses, newspapers, express companies, department stores and many other private corporations, firms, organizations and individuals patriotically co-operated with the government to receive and transmit applications for the liberty loan without expense to the United States or to the applicants. Never before was the whole machinery of business and enterprise organized into a great voluntary machine for service to the country without expectation of compensation or hope of reward except the satisfaction that It contributed Immeasurably to the success of the greatest loan In our history, and thus to the cause for which the loan was made. More than 4.000.000 men and women subscribed for tbe bonds and 99 per cent subscribed in amounts ranging from 160 to $10,000. The second liberty loan was offered Oct. 1. 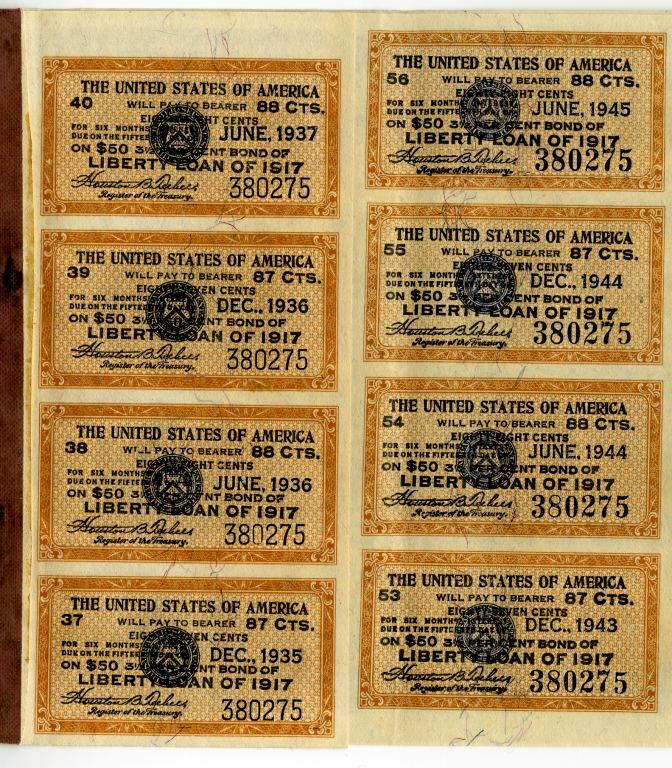 1917, the terms being as follows: "The secretary of the treasury invites subscriptions, at par and accrued Interest, from the people of the United States for $3,000,000,000 of United States of America 10-25 year 4 per cent convertible gold 'bonds of an issue authorized by act of congress approved Sept. 24. 1917. the right being reserved to allot additional bonds up to onehalf the amount of any oversubscription." The treasury department estimated that the second liberty lean was subscribed to by 9,500000 persons and corporations.